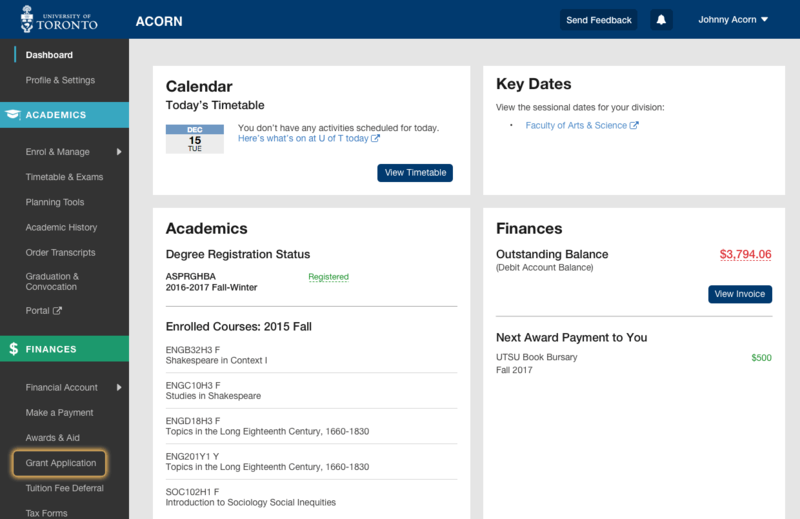 From the ACORN dashboard, click ‘Enrol & Manage’ on the main navigation menu on the left side of the screen. 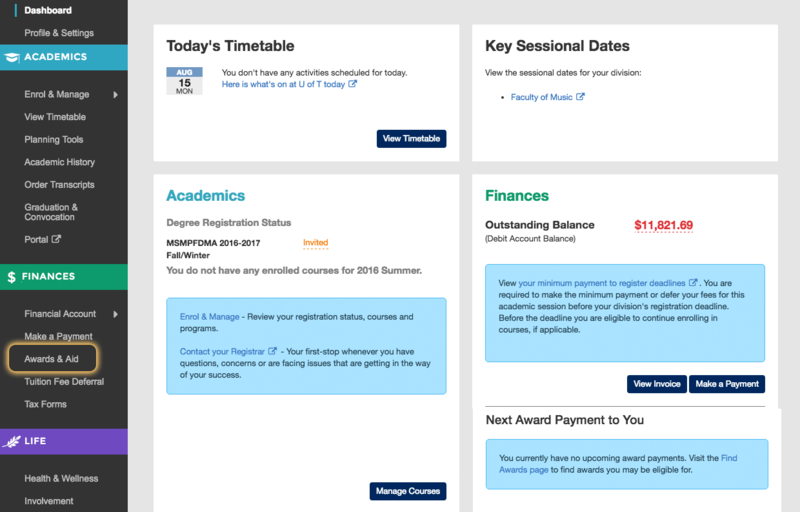 At the top of the ‘Enrol & Manage’ screen choose the session tab you’d like to enrol courses in (I.e. 2015-2016 Fall/Winter vs. 2015 Summer). Click the ‘Courses’ button under the session tab chosen in the previous step. Use the search field to search for courses by course code or title. Results will start appearing after three characters. Click on the course you would like to enrol in. A pop-up modal window will appear. Select the primary section (i.e. lecture) and any secondary sections (i.e. tutorial, practical) you are interested in. 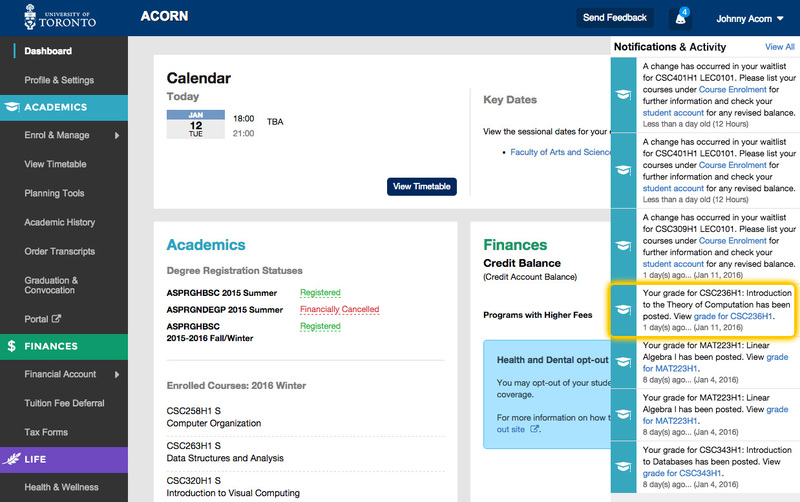 If you have successfully enrolled in the course you will receive a success notice on the top right corner of your screen and the course will be listed under your currently enrolled courses. On the course enrolment pop-up modal, select the lecture section and any secondary sections (I.e. Tutorial) you are interested in. Click the ‘Add to enrolment cart’ button. The course activities you’ve selected are now saved in your enrolment cart at the bottom of the Courses screen. You may enrol in these activities directly from the cart when your enrolment period is active. See also: Enrol in a course from the enrolment cart. Click ‘Courses’ under the session tab chosen in the previous step. 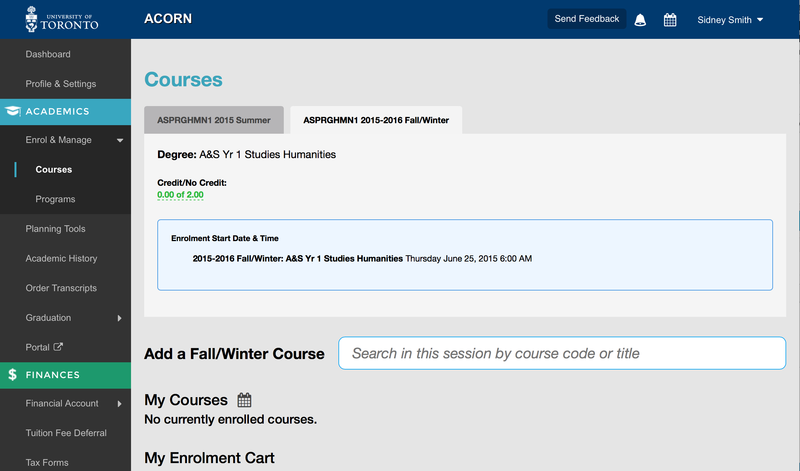 Find your enrolment cart at the bottom of the Courses screen. For each course activity you would like to enrol in, click the ‘Enrol’ button. You will see a confirmation pop-up modal asking whether you would like to confirm enrolment in this course. Click ‘Enrol’. On the course enrolment pop-up modal, select the course section(s) you would like to enrol on the waitlist for. 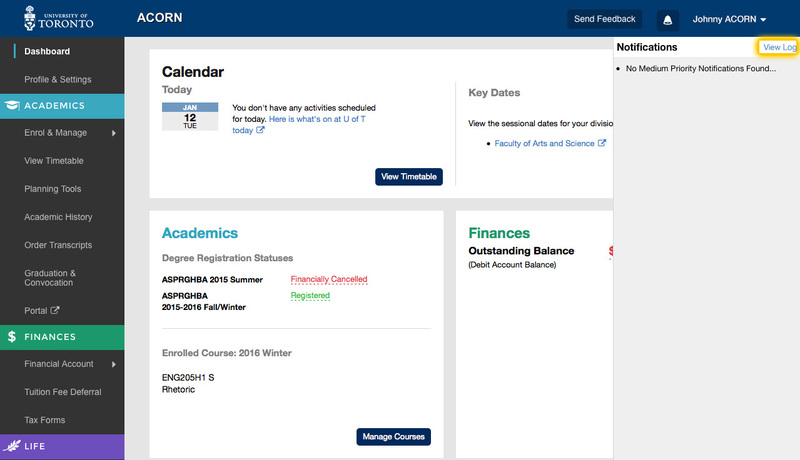 If you have successfully enrolled on the waitlist for the course you will receive a success notice on the top right corner of your screen and the course will be listed under ‘Waitlisted’ below your currently enrolled courses. Where can I find my enrolment start day and time? On the Courses screen, click the pencil icon on the right side of the course section that you want to change. On the course’s pop-up modal, select the course section(s) you would like to switch to. 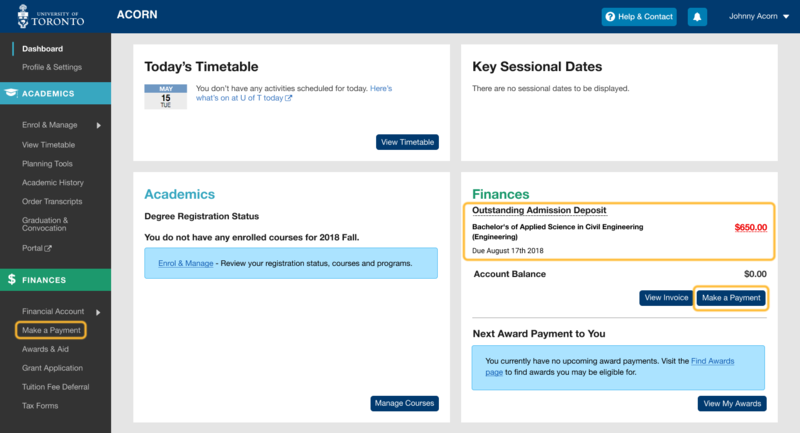 If you have successfully switched to your desired course section you will receive a success notice on the top right corner of your screen and the change will be reflected on the Courses page. On the Courses screen, click the gear icon on the top right corner of the course you want to designate as Credit/No Credit. Select ‘Add Credit/No Credit’ from the drop-down menu that appears. If you have successfully added the Credit/No Credit you will receive a success notice on the top right corner of your screen. On the Courses screen, click the gear icon on the top right corner of the course you want to drop. Select “Drop Course” from the drop-down menu that appears. On the course pop-up modal that appears, review the information presented and click ‘Drop Course’. 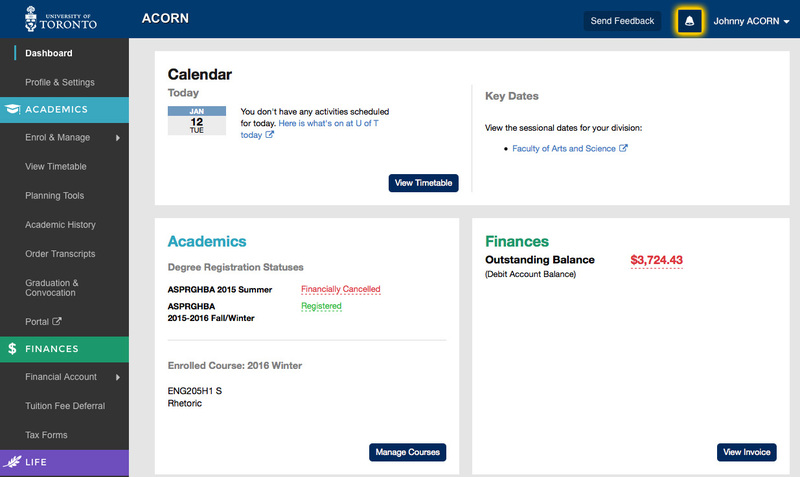 If you have successfully dropped the course you will receive a success notice on the top right corner of your screen and the course will no longer be listed under your currently enrolled courses. How do I know when my final grades are out? When a final grade is released for each of your courses, you will see a blue badge containing a number on top of a bell icon at the top of your screen. This leads to your Notifications & Activity log. Click this icon. 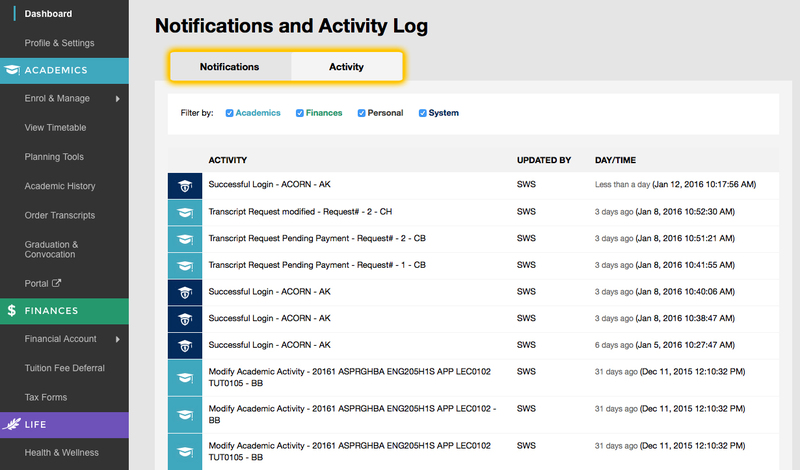 If you have received a final grade, there will be a notification here alongside a log of any other notifications and activity in your account. Click the link within the notification to view your grade. You will be taken to your Academic History page containing your final grade for the course. 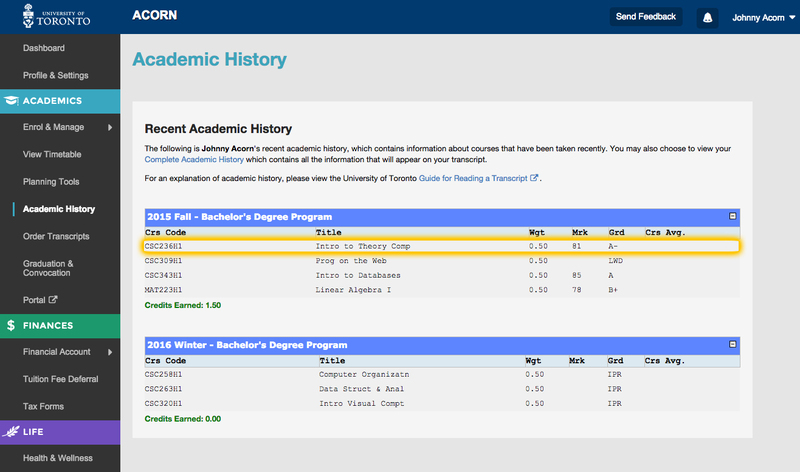 You can come to your Academic History page at any time via the left navigation menu on ACORN to see an up-to-date list of your final grades. 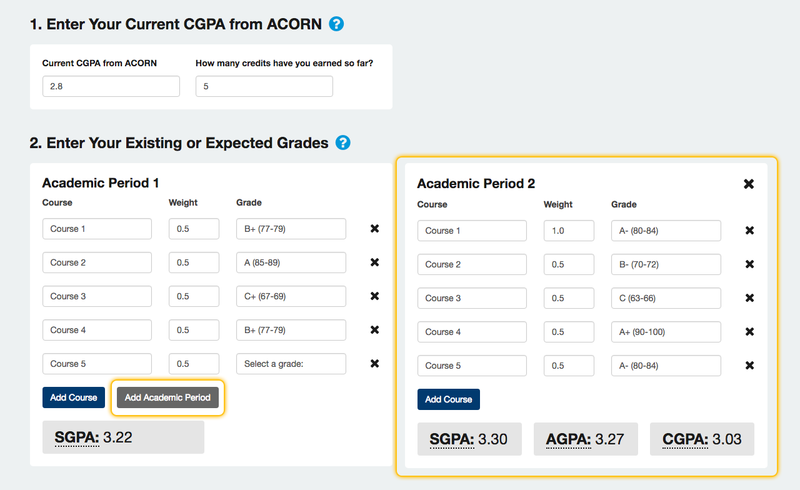 Watch a video walkthrough of the GPA calculator. The GPA calculator is a U of T-wide tool that allows you to estimate your GPA (Grade Point Average) for the current or upcoming academic sessions. This tool should be used for planning purposes only; refer to your Academic History page in ACORN for your official GPA calculations. Before starting, have your grades on hand for reference. Find them on the Academic History page in ACORN. When entering grades, include failed courses, and exclude transfer credits, extra (EXT), Credit/No Credit (CR/NCR) and Late Withdrawal (LWD) courses. 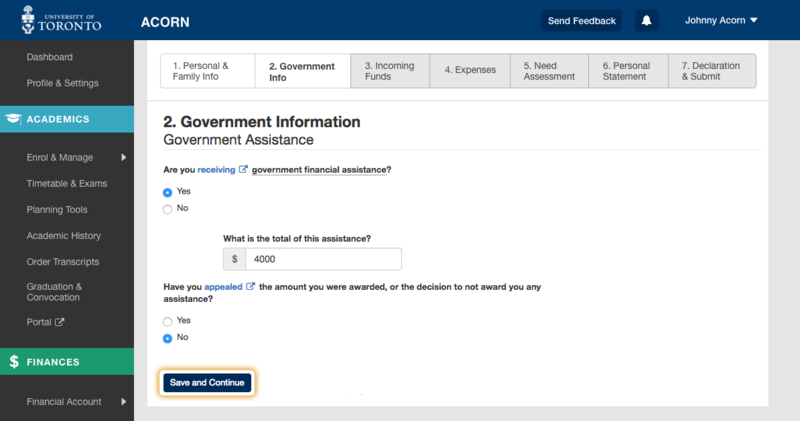 You can view tips for using the GPA Calculator by clicking the help icons beside the step one and step two headings. 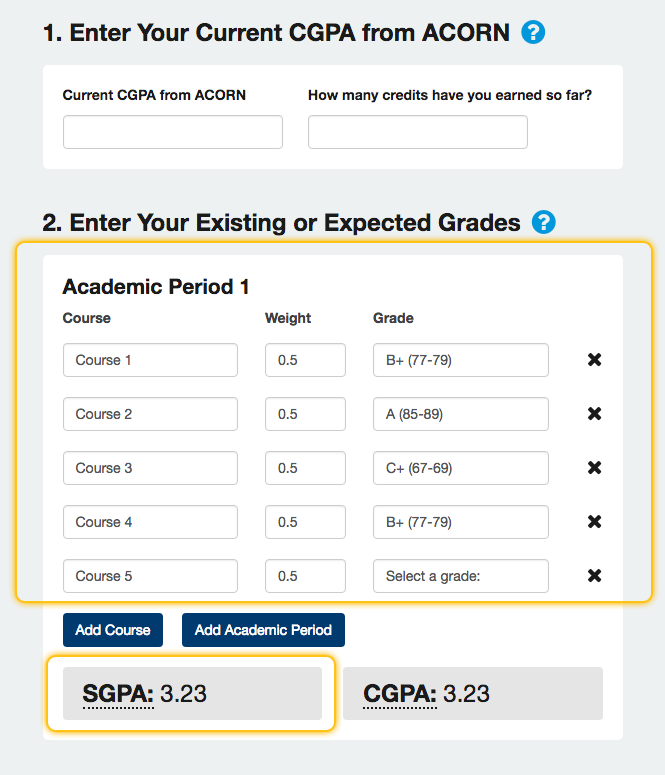 To estimate your Cumulative GPA (CGPA), enter your current Cumulative GPA and current number of credits earned from ACORN into Step 1 of the calculator. This step is optional; you can always enter all of your grades manually into the Academic Period containers, but this method is faster. In this example, “Academic Period 1” will mean whichever session you are predicting your grades for. If your official CGPA from ACORN was calculated last Winter, and you are predicting courses for the current Fall/Winter session, Academic Period 1 will represent the Fall semester. You can also enter all of your Fall and Winter marks into Academic Period 1, or enter Fall marks in Academic Period 1 and Winter marks in Academic Period 2. It is up to you. Next, enter anticipated grades for your courses in progress. Your Sessional and Cumulative GPAs will update immediately at the bottom of the Academic Period 1 container. Your CGPA calculation will take into account the “Current CGPA from ACORN” that you entered in Step 1. Your SGPA calculation will only take into account grades entered in Academic Period 1. To estimate your Sessional GPA (GPA), enter current and anticipated grades for a single Fall or Winter or entire Summer session (this includes both sub-sessions) in Academic Period 1. You do not need to add your Current CGPA from ACORN in Step 1 unless you want to see your potential CGPA at the same time. To calculate your Annual GPA (AGPA), enter current and anticipated grades for the Fall session in Academic Period 1 and the Winter session in Academic Period 2. 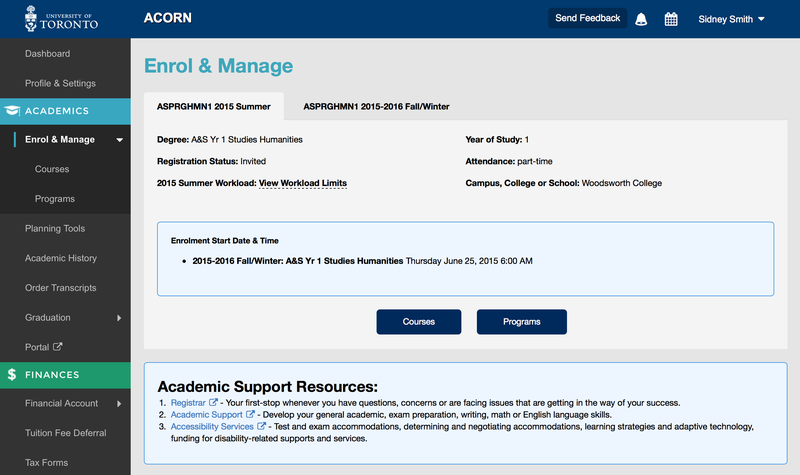 You will need to click the “Add Academic Period” button to open the second session. If you are including Y courses worth 1.0 credit courses: Include grades for these courses in Academic Period 2, as grades for these courses are calculated in the Winter term. On your Academic History in ACORN, for the Fall session these courses will have a grade of “IPR” (In Progress). If you enter Y courses in Academic Period 1 (Fall), your estimated AGPA will not be correct. Tip: If you already know your Fall SGPA, enter it in Step 1 along with the number of credits you earned for the Fall, and enter your Winter grades in Academic Period 1. The calculated CGPA will actually be your AGPA. Some useful academic resources are located below the calculator itself. If you want academic advising or have questions about courses, contact your Registrar. 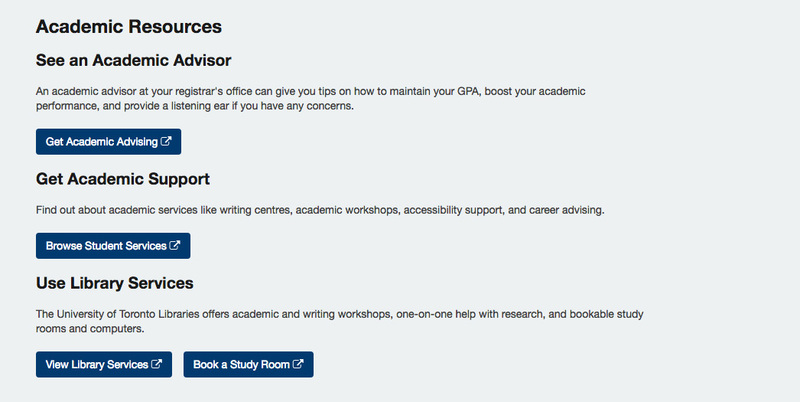 You can also find links to helpful academic workshops and events that U of T offers, as well as study spaces you can use. 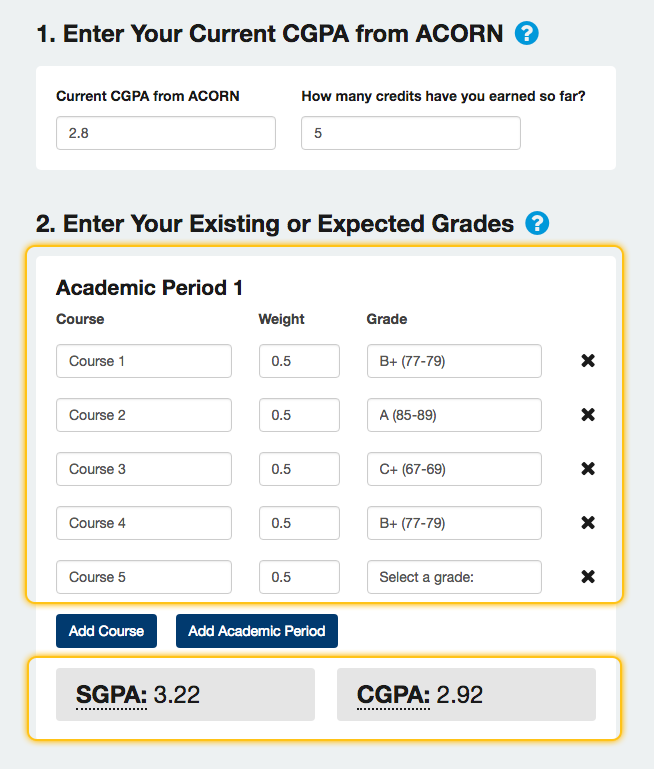 We want to hear your thoughts, ideas and suggestions to improve this GPA Calculator! We care about how and if it works for you, so send us a message via the “Send Feedback” button towards the bottom of the page. 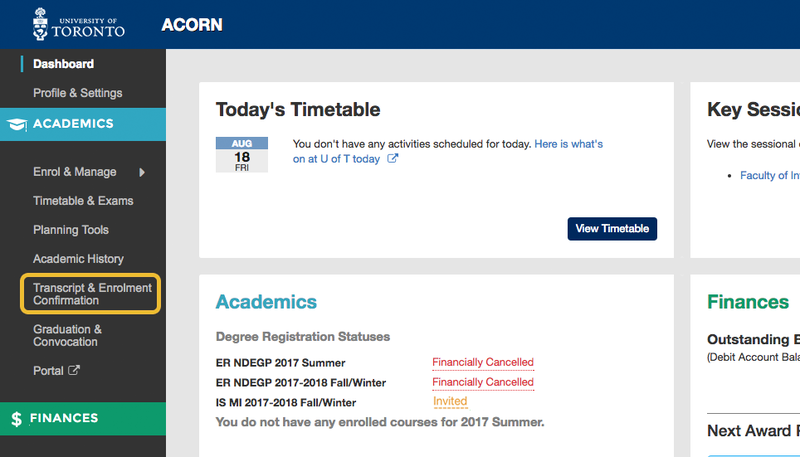 From the ACORN dashboard, click ‘Enrol & Manage’ on the left hand menu. On the Enrol & Manage landing screen click the ‘Programs’ button. To enrol in a program, use the search field to search for programs by program code or title. Results will start appearing after three characters. Click on the program you would like to enrol in. On the program enrolment pop-up modal, review the information presented and click ‘Enrol’. If you have successfully enrolled in the program you will receive a success notice on the top right corner of your screen and the program will be listed under your currently enrolled programs. On the program enrolment pop-up modal, you will be notified that the program you selected requires approval. Review the information presented and click ‘Request to Enrol’. If you have successfully requested to in the program you will receive a success notice on the top right corner of your screen and the program will be listed under your requested programs. Note: Type 3 programs cannot be enrolled in, or requested from, ACORN. We will notify the student of this and help them find the appropriate application page for these programs. 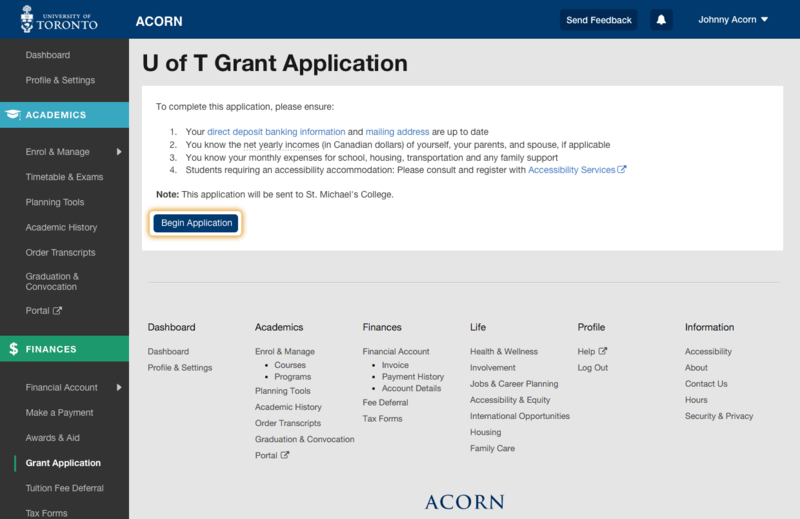 On the program enrolment pop-up modal, you will be notified that the program you selected requires a separate application and cannot be completed through ACORN. Review the information presented and click ‘Request to Enrol’ which will take you to the appropriate website to help you apply for the selected program. On the Programs screen, click the gear icon on the top right corner of the program you want to drop. Select “Remove Program” from the drop-down menu that appears. On the program pop-up modal that appears, review the information presented and click ‘Drop’. 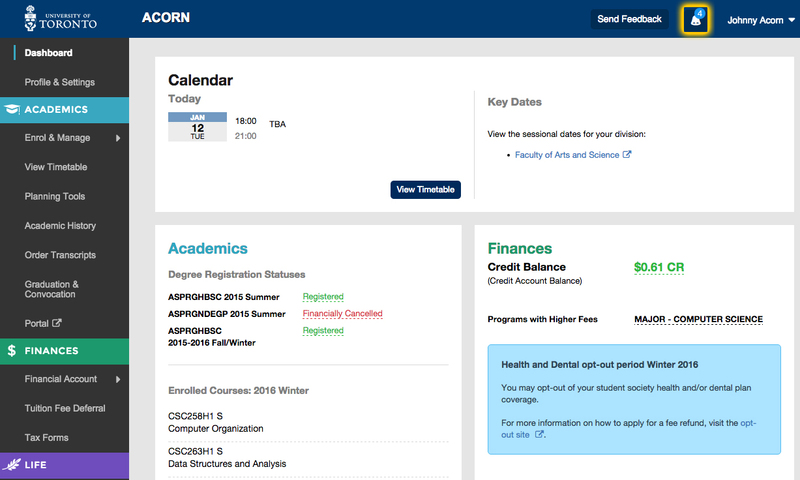 If you have successfully dropped the program you will receive a success notice on the top right corner of your screen and the program will no longer be listed under your currently enrolled programs. On the ACORN dashboard, click ‘View invoice’ on the Finances status box. From the ACORN dashboard, click ‘Financial Account’ on the left hand menu under Finances. Click ‘Payment History’ on the sub list of items under the Financial Account menu heading. 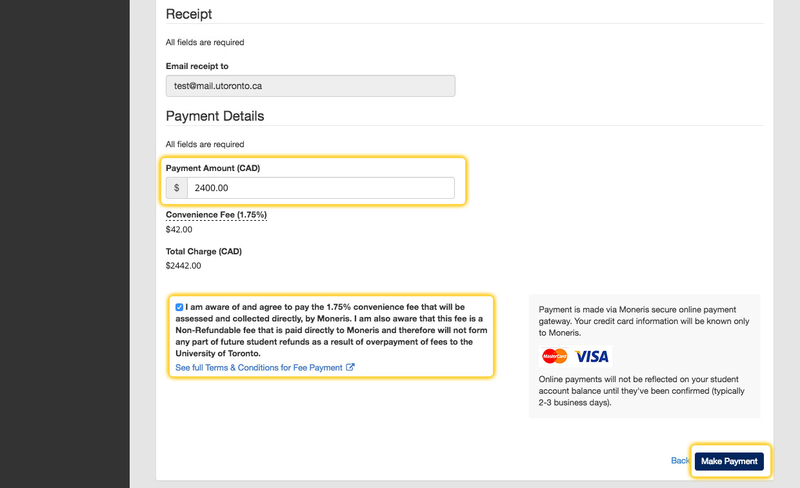 To defer fees, click ‘Tuition Fee Deferral’ on the left hand menu under Finances. If you are eligible to defer fees, click ‘Process Fee Deferral’ and confirm. 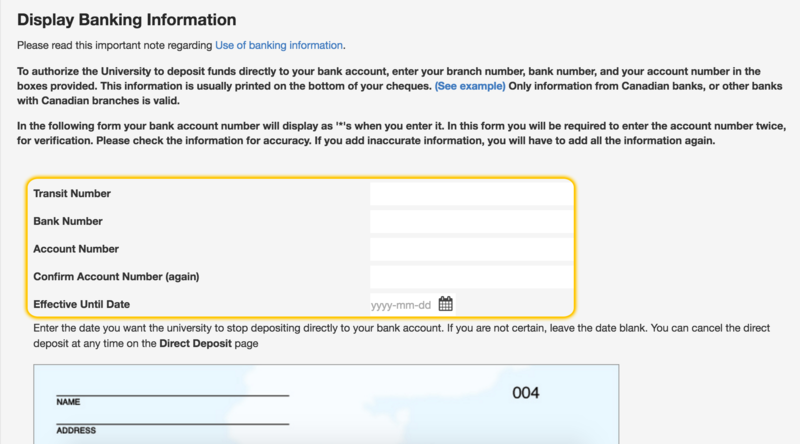 On the Financial Account screen, locate the direct deposit card and click ‘Direct Deposit’. Enter your banking information. You can find your Transit, Bank and Account numbers by requesting a blank cheque or a print-out of your banking information from your bank. Click ‘Add This Information Now’. After you have successfully added your banking information, you will get a confirmation message. From the ACORN dashboard, click ‘Tax Forms’ on the left hand menu under Finances. On the ACORN dashboard, click the “Make a Payment” link on the left navigation or the “Make a Payment” button near the bottom of the Finances card. 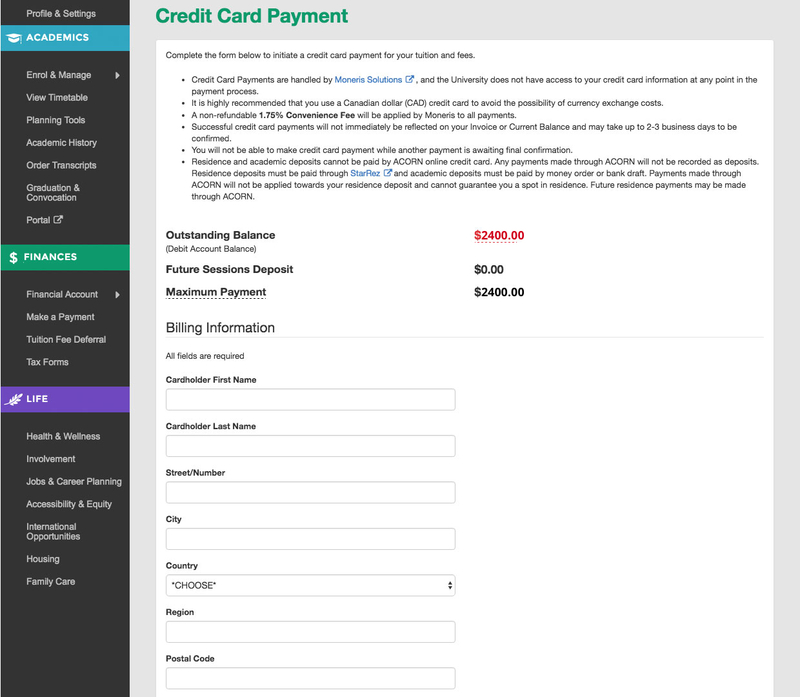 On the Make a Payment Page, click the “Make a Payment by Credit Card” button. Keep in mind that a 1.75% convenience fee will apply to the transaction. After you have read the instructions, fill out your billing information. Enter the amount you want to pay. Please note that your payment amount cannot exceed your outstanding balance in ACORN. Read and agree to the terms & conditions and click the “Make a Payment” button to move on to the credit card payment step. Enter your credit card information and click the “Process Transaction” button to complete your payment. Your payment will be processed by Moneris within approximately two business days. 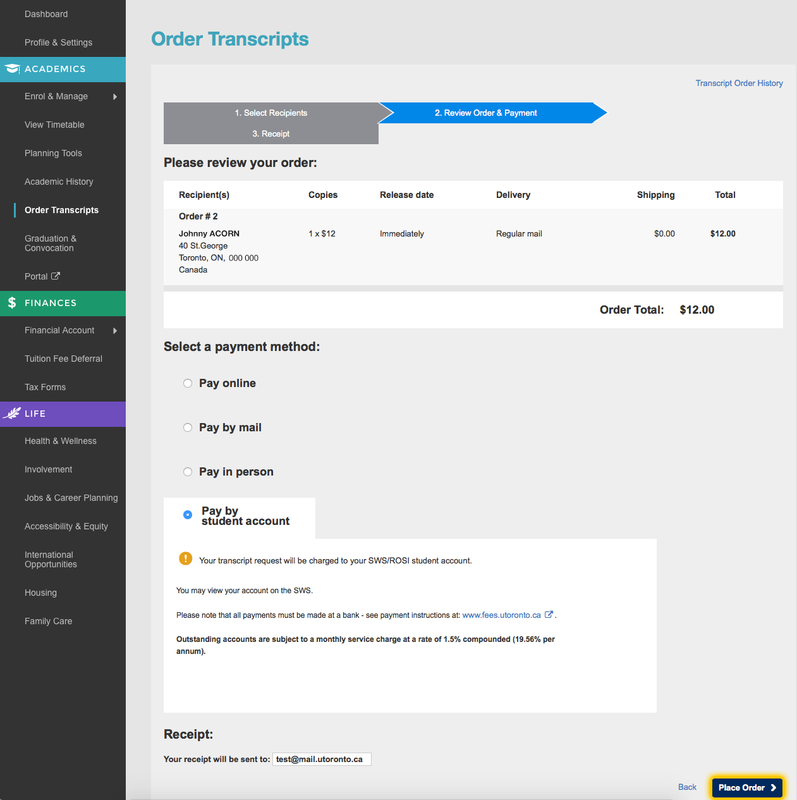 Click the “Awaiting Final Confirmation” link beside the pending payment to view and download your receipt. You will not be able to make another payment until the pending payment has been approved. From the ACORN Dashboard, click “Awards & Aid” on the main navigation menu on the left side of the screen. You will be on the “Find Awards” section of the Awards & Aid page. From here, you will see a personalized collection of resources that will direct you to sources of financial aid and awards that you may be eligible for. How do I use the Financial Planning Calculator? The financial planning calculator is an exploratory tool that anyone can use, from high school students to family members to prospective and current U of T students in any program or division. Use it to plan your upcoming year and get a idea of what it costs to study at U of T so there are no surprises. Before you begin, you should have a general idea of what you will be studying during the upcoming academic year and what your income and savings will be from all sources. This can include summer job savings, expected job earnings for the upcoming academic year or any financial assistance and awards you have received or expect to receive. To begin, go to the Financial Planning Calculator and click ‘Start Planning’. Provide background information by selecting options that currently apply to you, or if you are exploring your options, simply select which options you think apply to you. You can always change them later to see how your expenses will change. Click ‘Continue’ to proceed to the Estimated Expenses section. Estimate your various sources of income to the best of your ability. The more accurate your income estimates are, the more accurate our calculations and financial recommendations will be. If you have no income to enter for a particular field, you may leave it blank. If you want more information about what belongs in each expenses field, hover over (or tap, on a mobile device) the label you are curious about. Click ‘Continue’ to proceed to step 3. 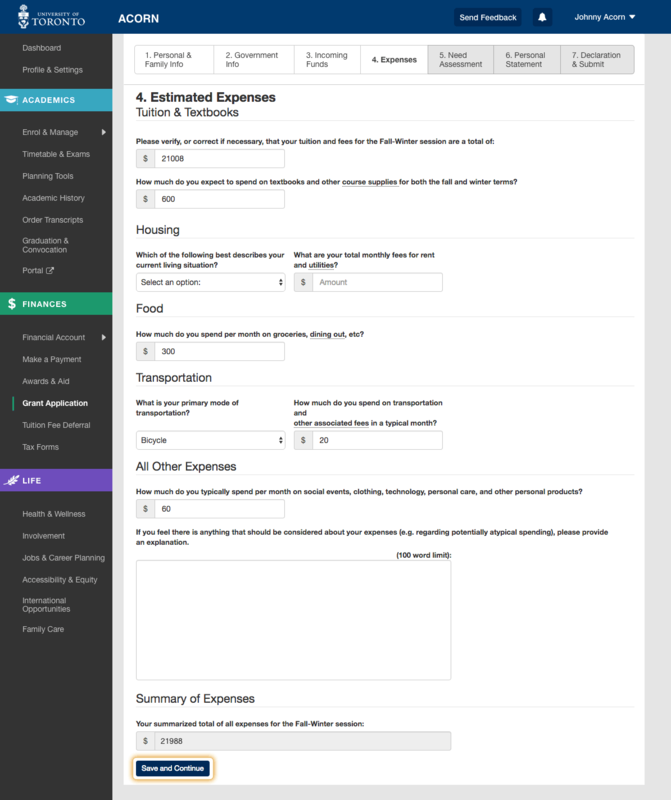 Based on the background information you provide, we calculate expense estimates for your upcoming academic year. We use educated estimates and calculated averages for many of these values, but feel free to change them to represent your individual situation more accurately. To see information about how each estimate was calculated, hover over (or tap) the label you are curious about. Click ‘Continue’ to proceed to the Summary page. On the Budget Summary page, you will see a graph displaying your income, expenses and a third bar indicating whether you are projected to be in a budget deficit or surplus. Below the graph you will find a list of personalized resources and next steps that you can take to find ways to save money or receive more financial support, depending on your situation. If you have a budget deficit, these resources will give you a few approaches to getting back on track. Want to see what it would cost to switch programs? Live away from home or on campus? Eat out at restaurants a little less and cook more? 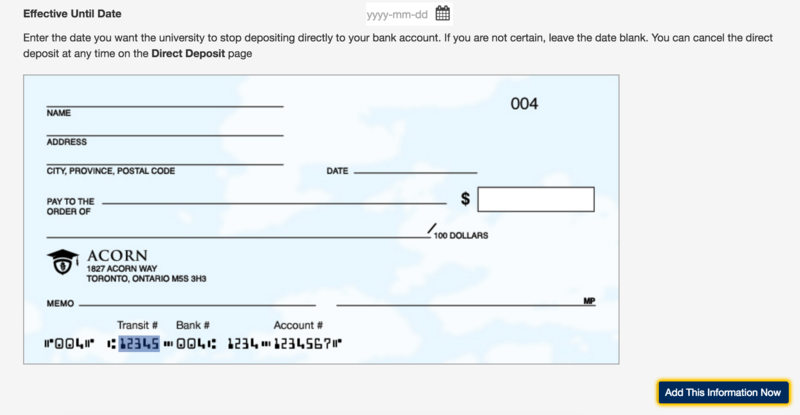 Use the “Jump to Step” menu to go back and change the information on the form. If you change any of your initial inputs, click ‘Recalculate Budget’ and you will be taken to the Budget Summary page with an updated budget summary and set of resources reflecting your changes. If you have any comments on how you used this calculator or suggestions on how to improve it, please let us know via the “Send Feedback” button at the bottom of the calculator. 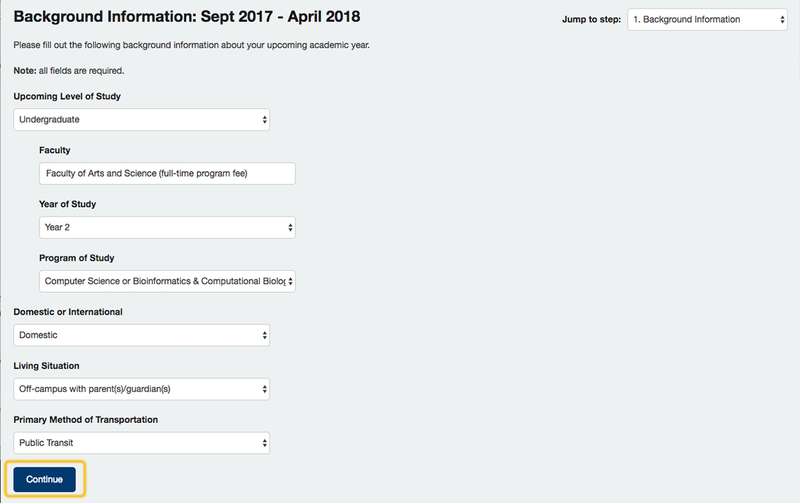 As of Summer 2018, if you will be receiving Full-Time OSAP for the Summer or Fall/Winter sessions, you will be able to see an estimate for what you may need to pay U of T once your upcoming OSAP is applied against your tuition & fees (learn about eligibility for Full-Time OSAP). This amount is called your “Net Cost”, and it will help you plan ahead and estimate how much in awards funding you may need to seek, or how much you may need to pay out of pocket. 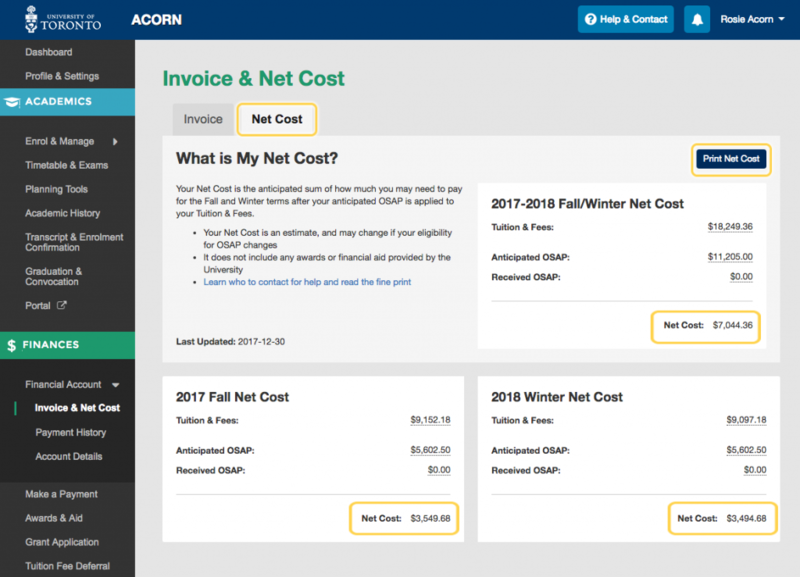 If you will be receiving Full-Time OSAP payments for the upcoming session, you can access your Net Cost page from the ACORN Dashboard. You can also go to Financial Account > Invoice & Net Cost via the left navigation, or click the “View Net Cost” button within the Financial Information card on your Financial Account page. Your Invoice and Net Cost exist on the same page, and you can switch back and forth between them using the two tabs towards the top. 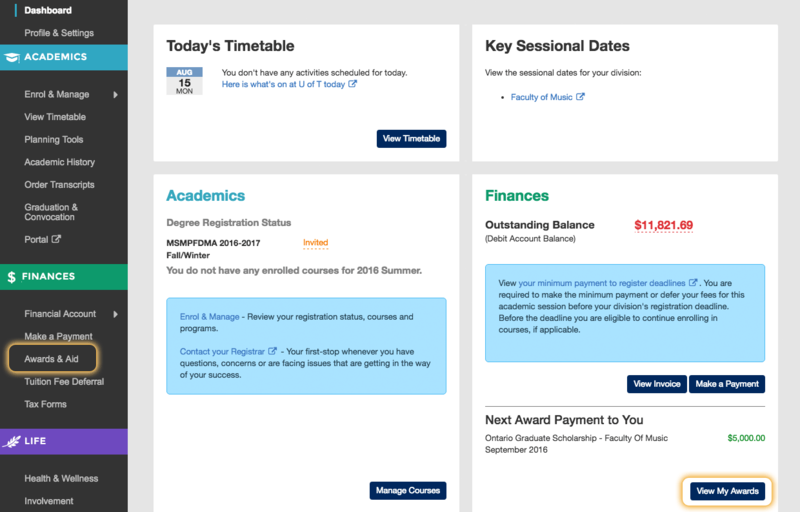 Your Net Cost overview for the entire Fall-Winter session is displayed at the top of the page, and contains your tuition and fee charges, anticipated OSAP and received OSAP for the entire Fall-Winter session. Below, your Net Cost is broken down into the Fall and Winter terms individually, and you can find your tuition and fee breakdown and estimated and received OSAP for each term. For specific definitions of each field, you can hover over an amount—or tap it on mobile—to see more information about it. In these cases, unfortunately ACORN cannot display your Net Cost because it does not have an OSAP funding estimate. Your actual Net Cost may vary if the information used to calculate your OSAP assessment is updated. Your Anticipated OSAP is the amount of assistance that OSAP will send directly to the University of Toronto to apply to your tuition and other fees, and is based on your most recent OSAP assessment. If you do not register in the program or course load you indicated on your OSAP application, your eligibility for this assistance may change. If your Anticipated and Received OSAP amounts are less than your total OSAP funding, OSAP will deposit the difference directly to your bank account. Log in to your OSAP account for the current status of your grants and loans. 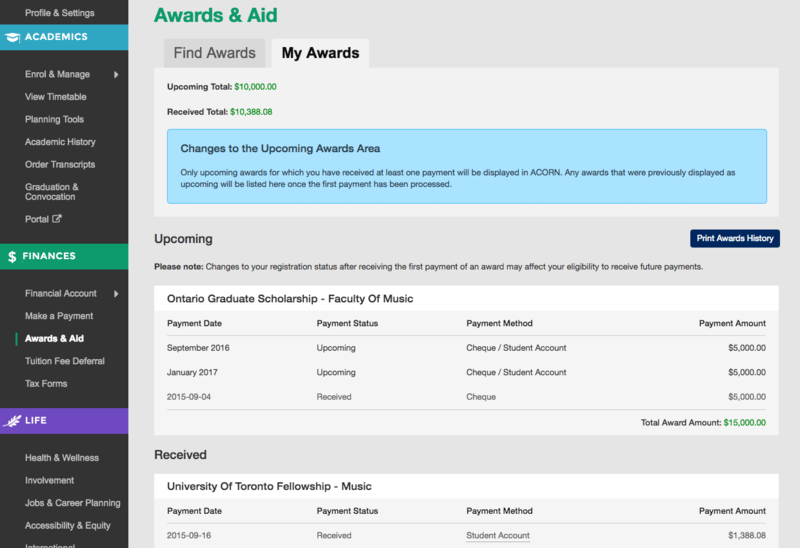 There are circumstances where grants provided through OSAP may be converted into OSAP student loans. OSAP grants reflected in your net cost do not include the Ontario Living and Learning Grant (for Crown Wards only). Before paying an admission deposit, please make sure you have accepted the admission offer to your degree program by following your division’s instructions. For undergraduate students who applied through OUAC, you will need to accept your offer on OUAC. 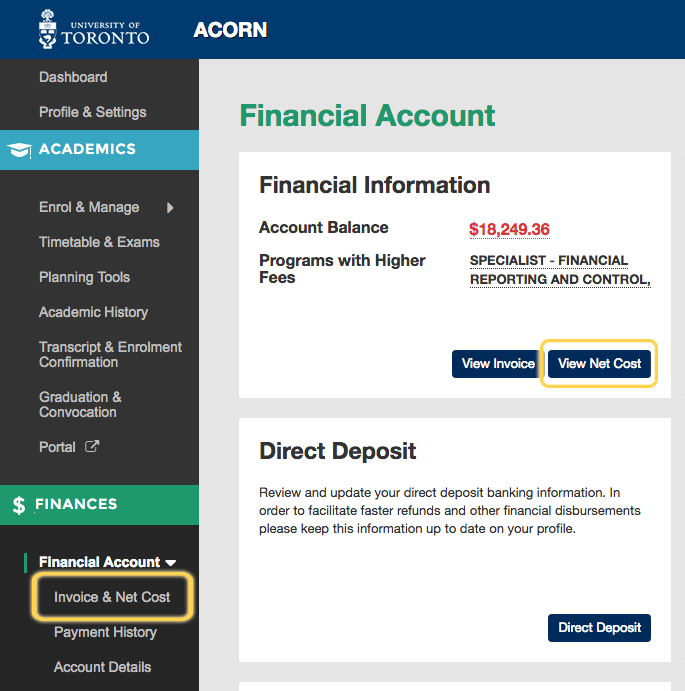 On the ACORN dashboard, you will see the admission deposit that you can pay for in the Finances card. Multiple deposits may appear here if you were admitted to multiple programs, so please ensure you pay for the right one. 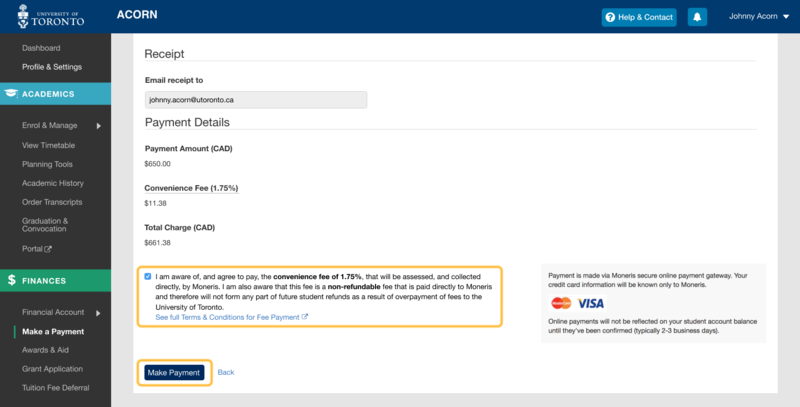 Click the “Make a Payment” link on the left navigation or the “Make a Payment” button near the bottom of the Finances card. 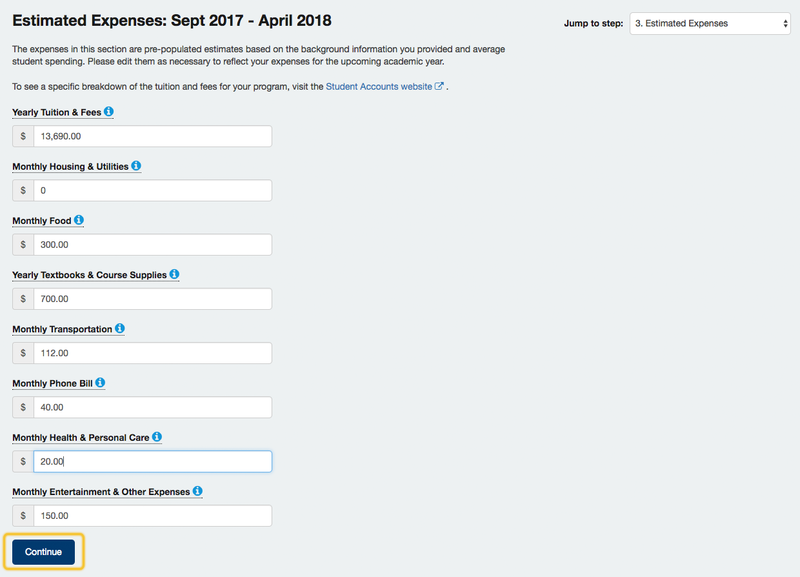 On the Make a Payment Page, you can learn about your options for how to make an admission deposit payment (bank draft, Visa or Mastercard). To initiate the credit card payment process, click the “Make a Payment by Credit Card” button. Keep in mind that a 1.75% convenience fee will apply to the transaction. After you have read the instructions, fill out your billing information. If you have the option to pay deposits for multiple degree programs, please ensure you select the correct one. Admission deposits can only be paid in full, so you cannot change the amount to pay. Read and agree to the terms & conditions and click the “Make a Payment” button to move on to the credit card payment step. Your payment will be processed by Moneris within approximately two – three business days. Click the “Awaiting Final Confirmation” link beside the pending payment to view and download your receipt. From the ACORN dashboard click ‘Profile & Settings’ near the top of the left hand menu. On the Profile & Settings page click ‘Address’. On the Address update screen click the pencil icon to edit an existing address, or ‘Add new’ to enter a new address. Follow the prompts on the screens following to save your address information. On the Profile & Settings page click ‘Phone Numbers’. On the Phone Numbers screen click the pencil icon to edit an existing phone number, or ‘Add new’ to enter a new number. Follow the prompts on the screens following to save your phone number information. 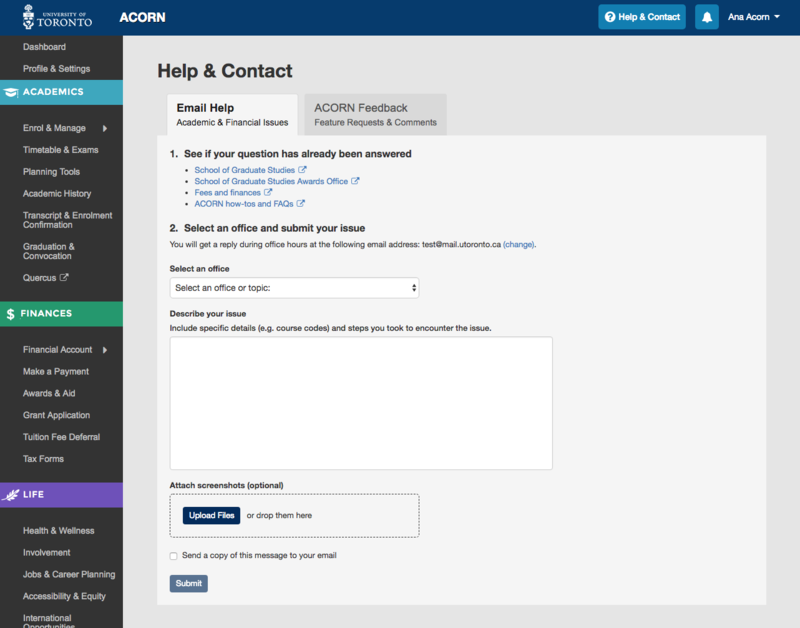 From any page on ACORN, click the bell icon located on the upper right corner of the page. Click ‘View Log’ on the top right of the notifications panel that opens. Click the ‘Notifications’ tab to view a list of your past notifications or the ‘Activity’ tab for a list of your past activity on ACORN. Firstly, be sure to familiarize yourself with the dates, deadlines and important information within the Graduation Checklist. 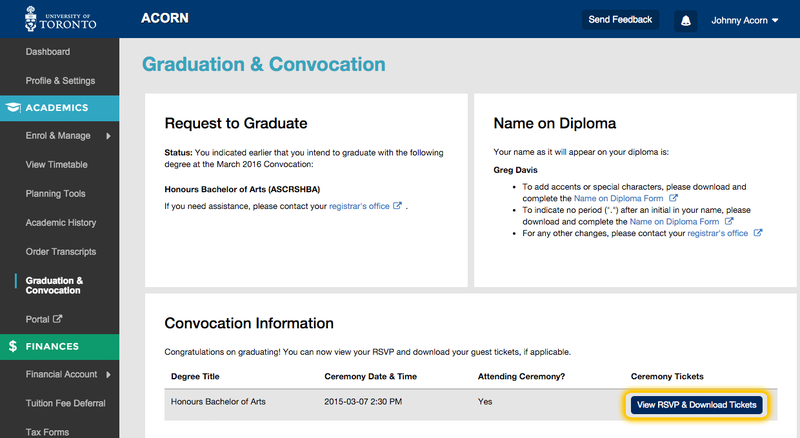 From the ACORN dashboard, click “Graduation & Convocation” on the left navigation menu. This page contains all information you will need concerning your graduation. 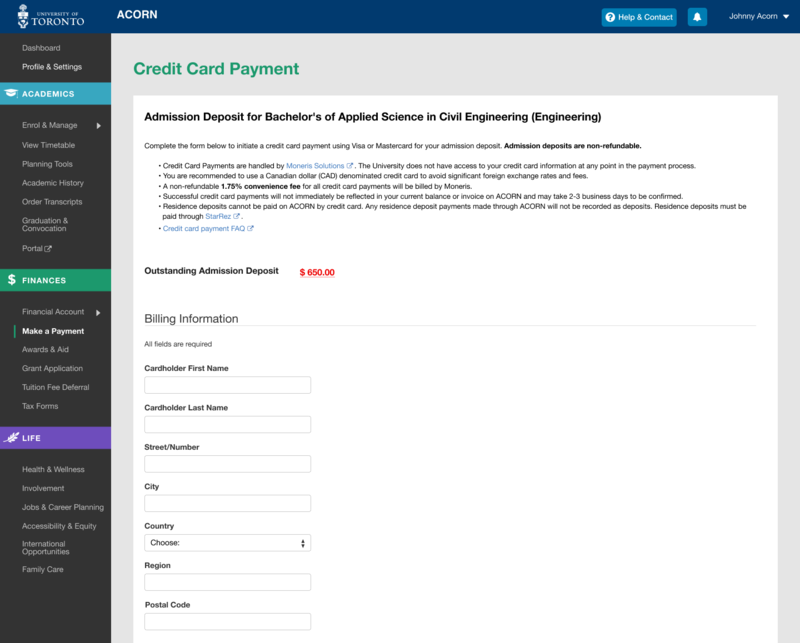 During the request to graduate period determined by your faculty, you will see a button that says “Confirm intent to graduate” in the Request to Graduate card. Click this to indicate whether you will or will not graduate during the session stated (March 2016 in this example). Please check the Name on Diploma card to make sure the name displayed is spelled correctly, as it will appear on your diploma as it is. If you require any changes to your name, follow the instructions to complete the Name on Diploma Form. If your faculty requires you to confirm your intent to graduate on ACORN and it is within the request to graduate period but you still aren’t able to, please contact your registrar. Select “Yes” if you plan to graduate, and “No” if you do not. 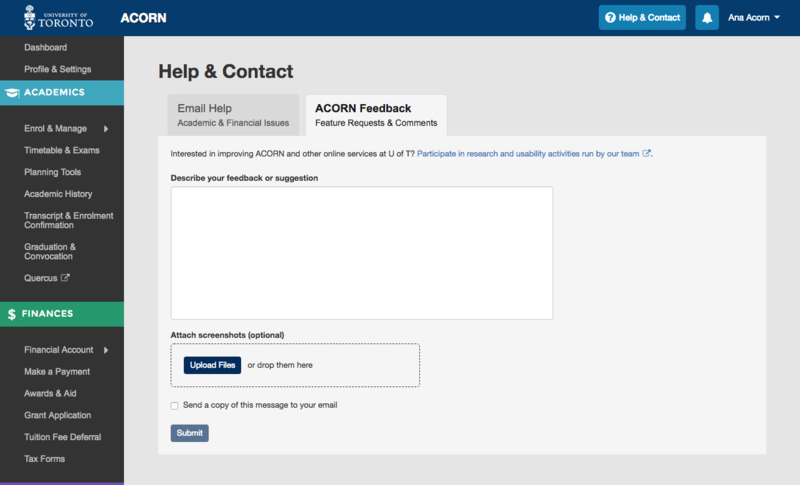 If your faculty requires a response from you via ACORN and you do not select either option, it will be assumed that you do not intend to graduate. 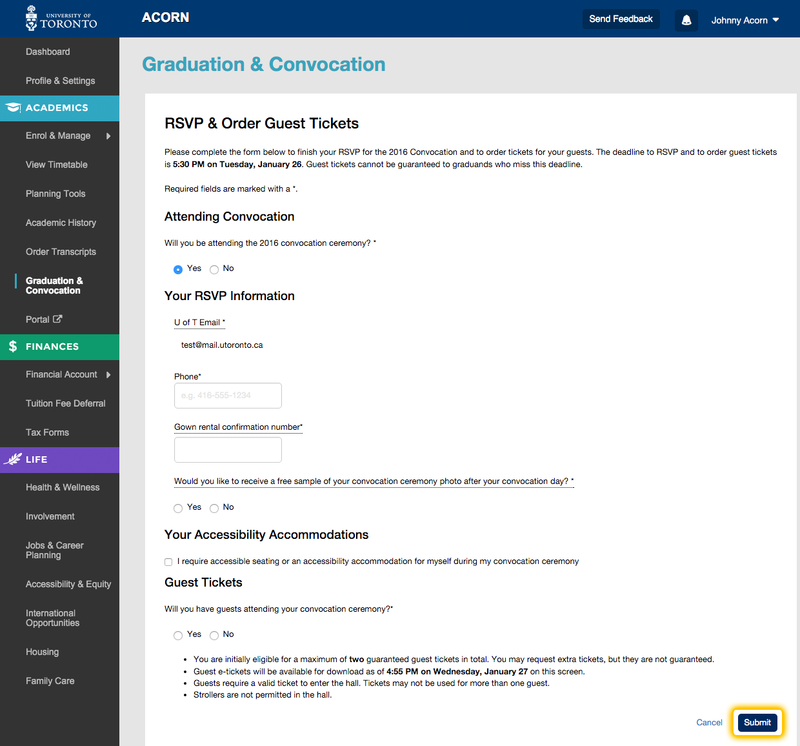 During the RSVP and guest ticket ordering period (see step 5 of the Graduation Checklist for dates), you will be able to RSVP for your graduation and order guest tickets. Click the “RSVP & Order Guest Tickets” button in the Convocation Information card to be taken to the form where you can fill out this information. RSVP for your graduation ceremony by selecting “Yes” or “No”. If you select “Yes”, fill out the rest of the RSVP & guest ticket form and select up to two guaranteed guest tickets and the number of extra guest tickets you would like to request. These extra tickets are not guaranteed and are distributed via a lottery system. Click the “Submit” button to complete your RSVP and guest ticket order. You will be presented with a confirmation notice containing the information submitted in your RSVP & guest ticket form. If there are any errors, edit the form using the pencil icon. Otherwise, you must wait until the date indicated on the confirmation screen before you can download your guest tickets and find out how many extra guest tickets you will receive. 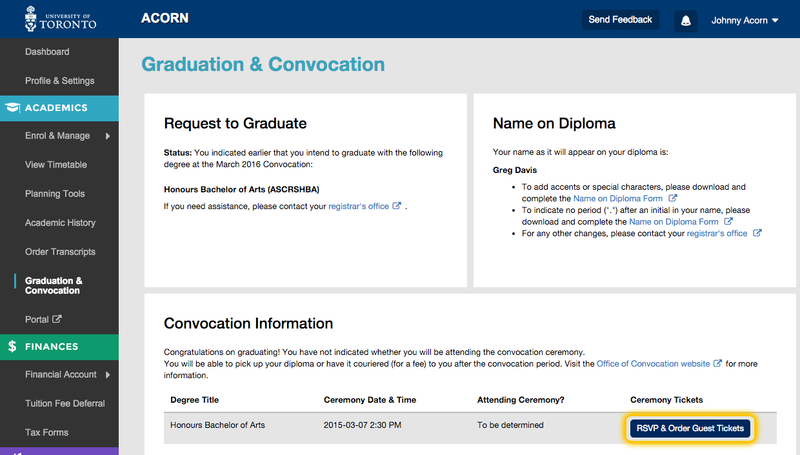 On or after the aforementioned date, return to the Graduation & Convocation screen and click the “View RSVP & Download Tickets” button in the Convocation Information card to download your guest E-Tickets (electronic tickets). Download your guest E-Tickets by selecting the check boxes and clicking the “Download Selected Tickets” button. Tickets will be downloaded to your computer as PDF files. If you select and download multiple tickets at once, they will be combined into one PDF file. If you wish to have the tickets remain as separate files to send to your guests, you will need to select and download each ticket individually. You can print a PDF version of several documents on ACORN, including your timetable, invoice, awards history and an unofficial version of your academic history. 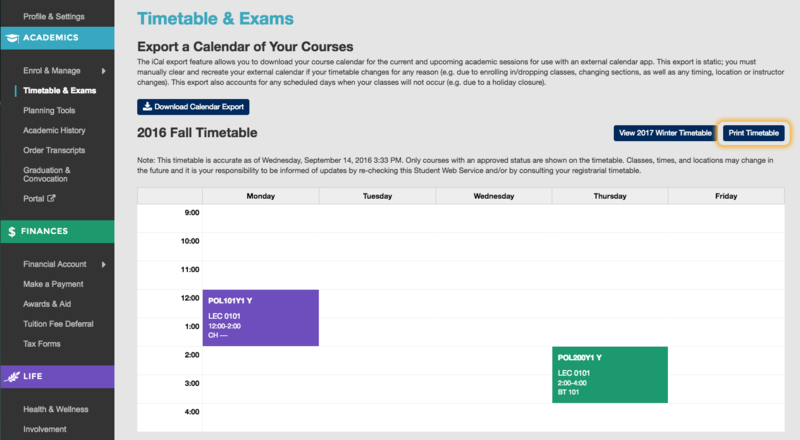 To print a copy of your timetable, navigate to the Timetable & Exams page via the left navigation and view the timetable for the session you want to print. Next, click the “Print Timetable” button to save your timetable as a PDF and/or print it. To print a copy of your invoice, navigate to the Invoice page via the Financial Account link on the left navigation. Click the “Print Invoice” button to save your invoice as a PDF and/or print it. 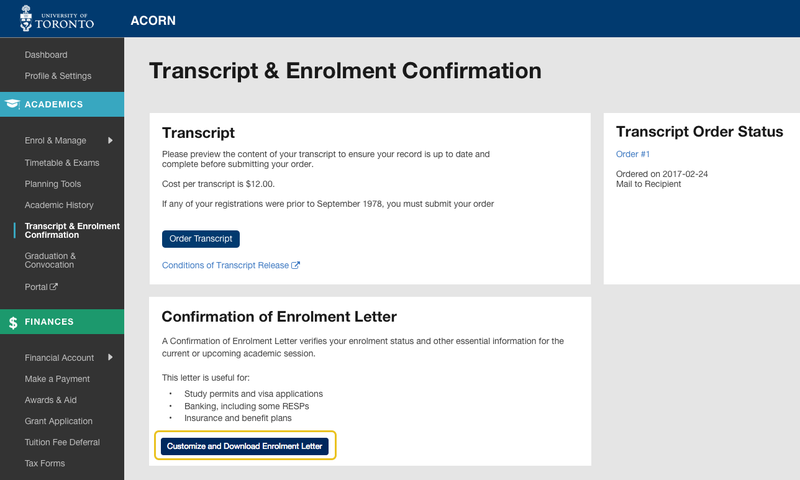 If you need an official, sealed copy of your academic history, you can order a transcript on the Order Transcripts page in ACORN. To print an unofficial copy of your academic history, navigate to the Academic History page via the left navigation. Click “Complete Academic History” towards the top of the page. Next, click the “Print Academic History” button to save your academic history as a PDF and/or print it. To print a copy of your awards history, navigate to the Awards & Aid page via the left navigation. Click the My Awards tab to view a list of your awards and click the “Print Awards History” button to save your awards history as a PDF and/or print it. 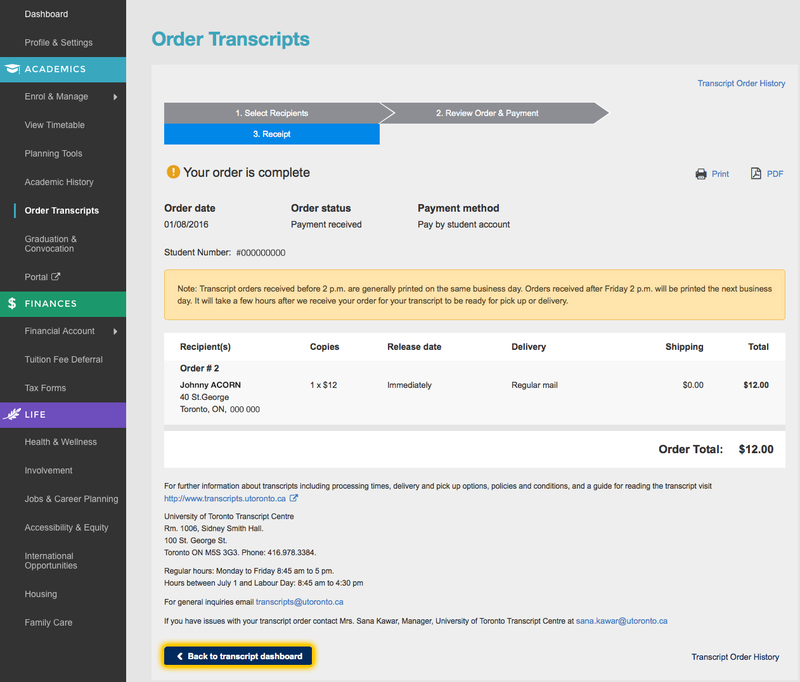 From the ACORN dashboard, click Order Transcripts on the left navigation menu. 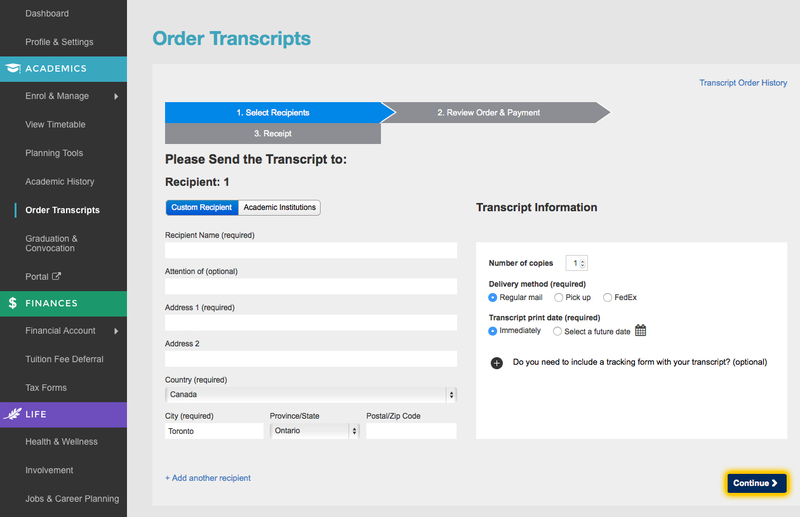 On the Order Transcripts landing page, click the “Order Transcript” button. Fill out the form with the required information and click the ‘Continue’ button. Review your order and choose your payment method. To complete your order, click the ‘Place Order’ button. You will be presented with a receipt of your order. 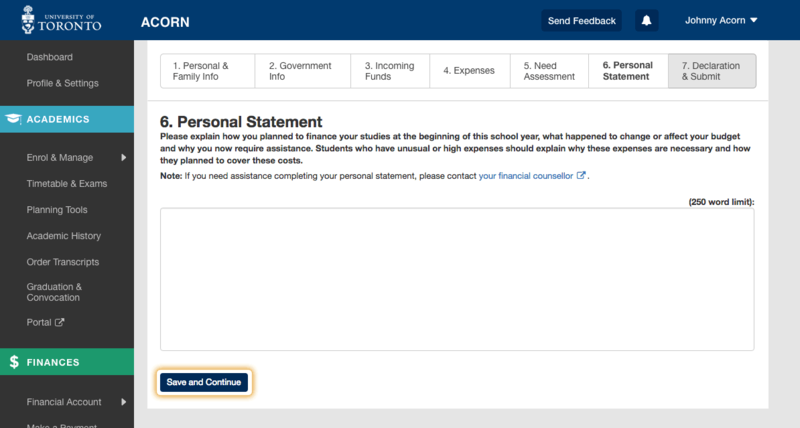 Click the ‘Back to transcript dashboard’ button to review your current transcript order status. 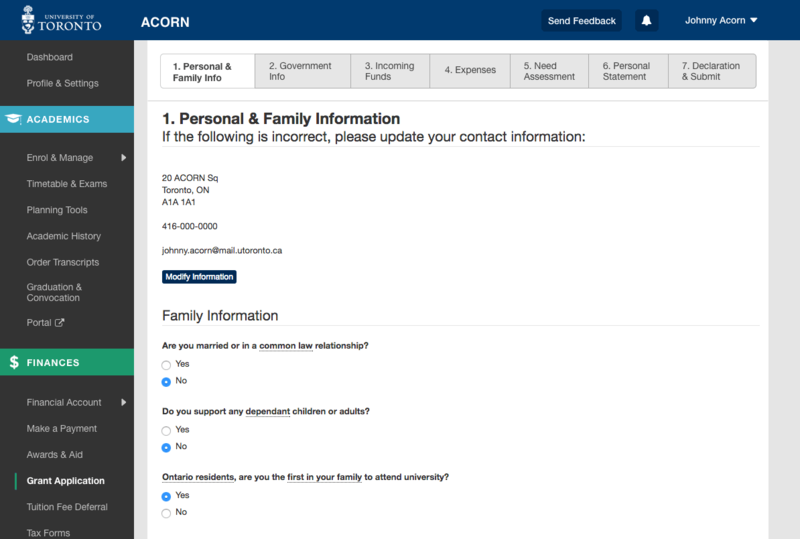 How do I generate a Confirmation of Enrolment letter on ACORN? Watch a video walkthrough of how to generate a Confirmation of Enrolment letter. A Confirmation of Enrolment letter is an official document that can be used to verify your status as a student at U of T. If your faculty allows students to generate letters via ACORN and you are currently registered or invited to register in a current or upcoming session, you can download a Confirmation of Enrolment letter in PDF format via ACORN by visiting the Transcripts & Enrolment Confirmation page. If your faculty does not provide these letters via ACORN, please contact your registrar to get one. * The Confirmation of Enrolment letter will only allow you to select an intended graduation date if you are a full-time student, and if ACORN has enough information to reasonably predict your graduation date. If you require an intended graduation date on your letter and do not see the option, or if this letter otherwise does not suit your needs, please request a custom letter from your registrar). 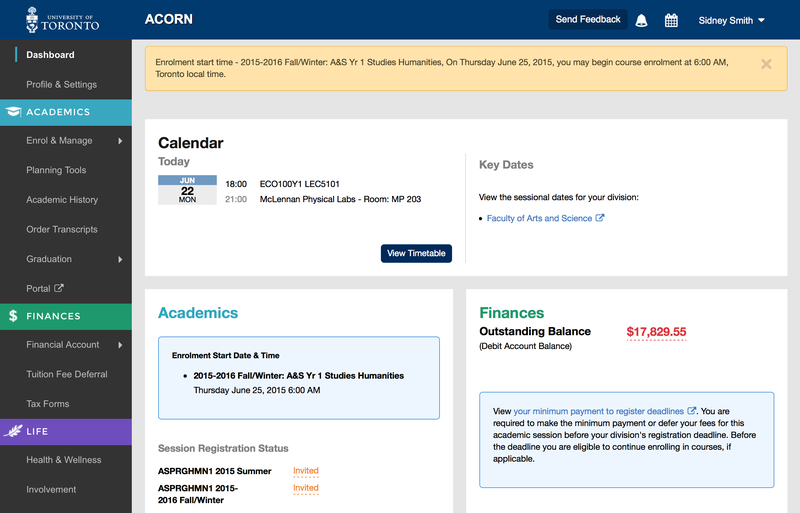 From the ACORN Dashboard, go to the “Transcript & Enrolment Confirmation” page via ACORN’s left navigation. Click the “Customize and Download Enrolment Letter” button. You will be brought to the Confirmation of Enrolment Letter page. Here you will be able to customize the information that appears on your letter. The information you can customize will depend on whether you are a full-time or part-time student, and whether you are Invited or Registered in only one session. If you are Invited or Registered for both the current and upcoming sessions, you will have the option to select the session for which you want the letter to confirm your enrolment. If you are Invited or Registered for only one session, you will not have the option to choose. 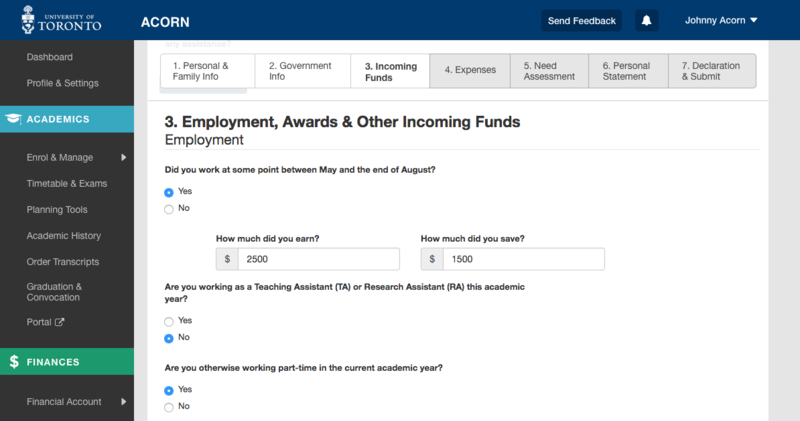 Next, select whether you want your full-time or part-time status to appear in the letter. Your current status for the indicated session will be used. 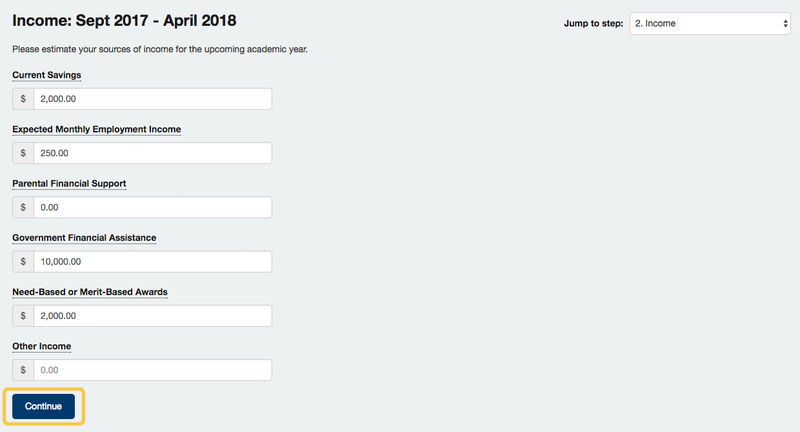 If you are a full-time student or if ACORN has enough information to reasonably predict your graduation date, you will have the option to include or exclude this date. If you select “Yes”, choose the month and year that you intend to graduate. Once you are satisfied with your selections, click “Download Enrolment Letter” to download a PDF of your customized letter. You must answer every question to download your letter. If you want to change your answers to the questions on the Confirmation of Enrolment form, simply adjust your answers and download your letter again.